In an effort to save money, I do not have much planned for today. I am going to work today (why isn't V-day a holiday? ), and going to see a movie (the obvious one... 50 things of something). Not that interesting. But what's more interesting is why I'm saving money... A riddle? To take my body to a place I have seen in years. The land of the freedom. The state of Katy Perry's song about the girls. PTZ anyone? Too difficult to guess? I'm going to California! In September. And Nevada. And Arizone. In September. It's going to be monumental. In September. California! That's right, this girl is coming to a Sprinkles cupcakes/Carl's Jr./Pinkberry near you! 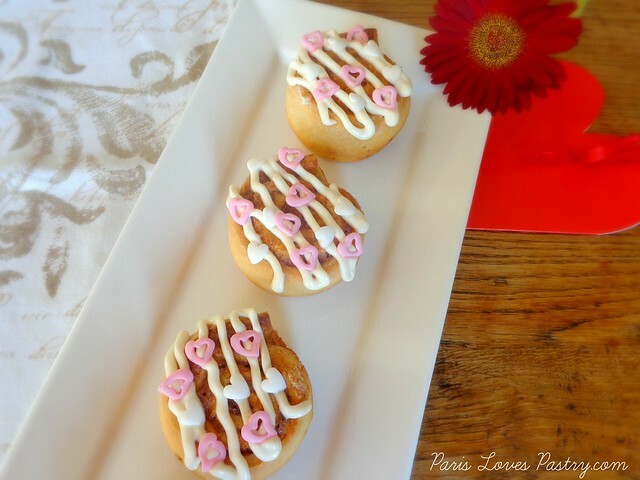 But before that, I have lots of baking to do, including this poll winner: cinnamon rolls with cream cheese glaze. I've been longing to make cinnamon rolls again for a long time because I think I'm addicted to the smell of yeast and cinnamon together in my living space. But also because I wanted to try out a new recipe. 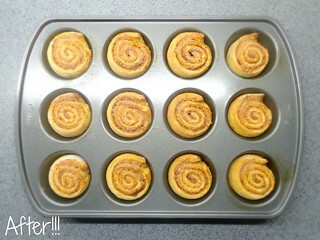 I normally bake the sour cream breakfast buns. These weren't as airy and bready as I had hoped they would be, but still tasted delicious. This recipe drew me because it only uses 7 ingredients! (minus the glaze) Can't beat that! Rating: 4.5 out of 5. * TIP: Make sure to use non-dairy milk for this recipe, otherwise the protein in dairy milk may kill the yeast if not scalded. - In a large sauce pan (or in a bowl in the microwave at 30 sec increments), heat the almond milk and 3 Tbsp butter until warm and melted, never reaching boiling. Remove from heat and let cool to 110 degrees, or the temperature of bath water. It should be warm but not too hot or it will kill the yeast. - Transfer mixture to a large mixing bowl and sprinkle on yeast. Let activate for 10 minutes, then add 1 Tbsp sugar and the salt and stir. - Next add in flour 1/2 cup at a time, stirring as you go. The dough will be sticky. When it is too thick to stir, transfer to a lightly floured surface and knead for a minute or so until it forms a loose ball. Rinse your mixing bowl out, coat it with canola or grapeseed oil, and add your dough ball back in. Cover with plastic wrap and set in a warm place to rise for about 1 hour, or until doubled in size. - On a lightly floured surface, roll out the dough into a thin rectangle. 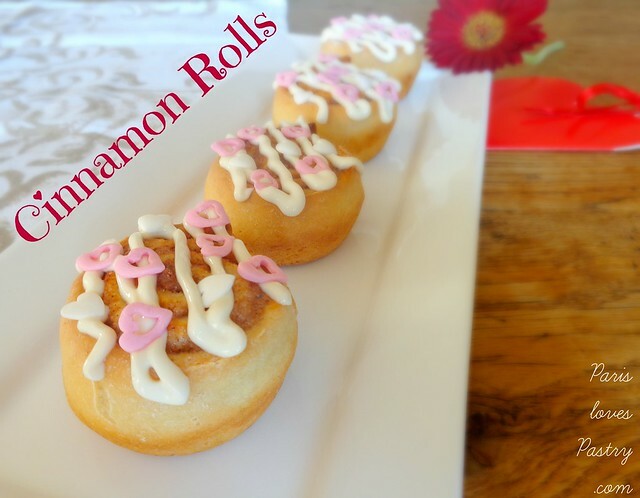 Brush with 3 Tbsp melted butter and top with 1/4 cup sugar and 1/2 - 1 Tbsp cinnamon. 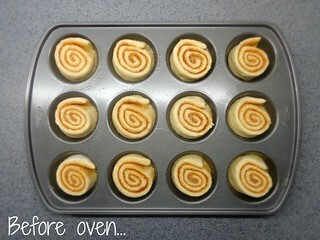 - Starting at one end, tightly roll up the dough and situate seam side down. Then with a serrated knife or a string of floss, cut the dough into 1.5 - 2 inch sections and position in a well-buttered 8x8 square or comparable sized round pan (you should have about 10 rolls). Brush with remaining 2 Tbsp butter (melted) and cover with plastic wrap. Set on top of the oven to let rise again while you preheat oven to 350 degrees F.
- Once the oven is hot, bake rolls for 25-30 minutes or until slightly golden brown. Let cool for a few minutes and then serve immediately. - Optional: Frost with cream cheese frosting or a simple mixture of powdered sugar and almond milk.